Neither one of us grew up wanting ordinary lives. Along the way though, we both came to know and be transformed by the most extraordinary person who ever lived- Jesus Christ. Individually, we felt led to throw away "normal" life in the US and live for Him among the broken and poor in heart. 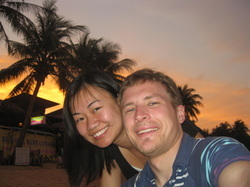 In 2008, our lives intersected while overseas. Realizing that we shared a common heart and vision for our lives (and that both kind of liked each other), in 2010 we got married! With hands open is how we desire to live our life. This takes us to some pretty awesome places and interesting situations, but also through challenges and valleys of life that shape and refine us. We are continuing to be transformed and affected by the same Jesus we met years ago. With Him, life's not normal, but at least it's never boring!